I’m a graphic designer, working in part with sales and marketing. I’m used to dealing with graphic representations of data, but I’m still constantly surprised by how terrible most graphs are. Even when most graphs are made by people who have to read graphs all day, like salespeople, project managers, advertisers, researchers and so on. If you work in or study a field where graphs are commonplace, this guide is for you. Better graphs don’t just keep designers happy, they’re also a more efficient way to communicate your message, which, at least in sales, yields better results. You want to be better understood, right? Thought so. When representing parts of a whole, you should probably use a pie chart. If you’re dealing with percentages of one thing, adding up to 100%, a pie chart is usually the optimal way to show it. You’ll be able to see all the differently sized pieces as a part of a whole right away! Unless when you have a lot of categories. Then it’s okay to use a bar graph. If a pie chart has too many segments, it no longer illustrates the portions clearly. When representing quantities that are independent from each other, use a column graph. 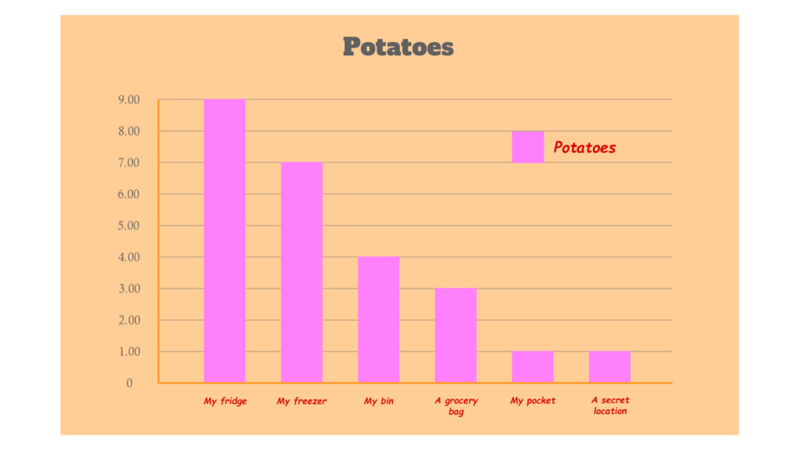 A line graph moves from one point to another and a pie chart would show your quantities arbitrarily as a part of a whole. Wouldn’t that be confusing? Ya gunna get caught. This is something I see mostly in advertising, but sometimes this deplorable practice sneaks its way even into research presentations. 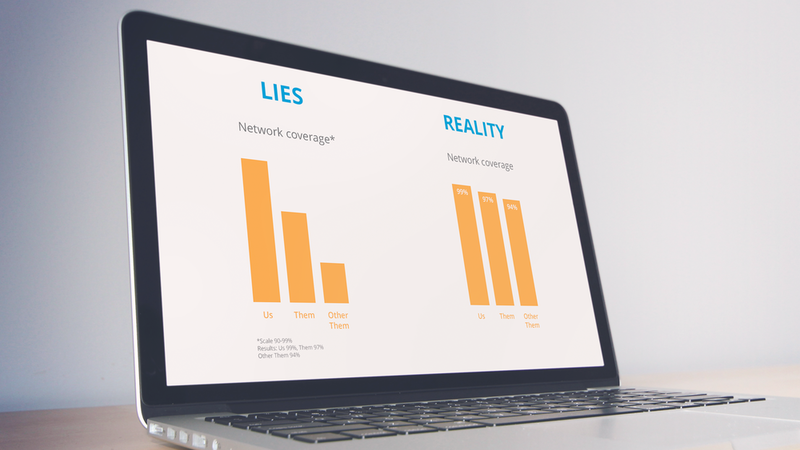 If your product is 2% better than your competitor’s, but you present your data in such a small scale that it looks like a huge difference, you might as well be lying. 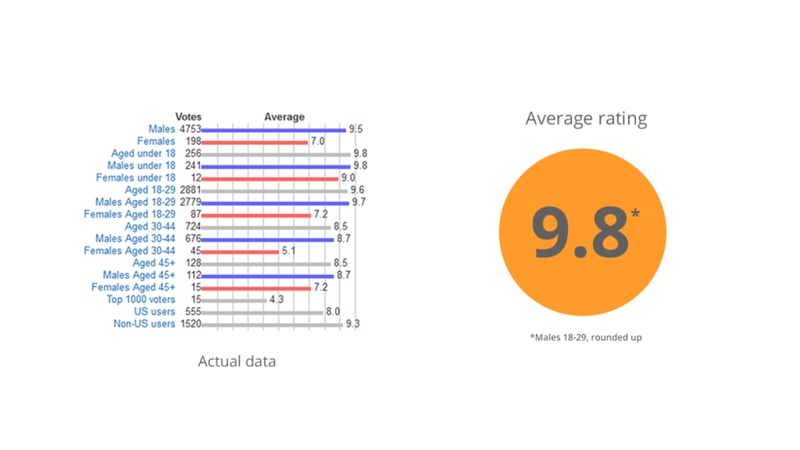 On the left you can see a typical way of messing with the scale, on the right is a realistic representation of the same data. If you cherry pick which results to include in your presentation, so that you’d better make your fraudulent point, you might as well be lying. And guess what? Someone who’s smarter than a bag of rocks will notice and you’ll get caught. Every time. Let’s take a few steps to rectify the situation. Start by removing all backgrounds, special effects and all other froo-froo. That means 3D-effects, bevels, drop shadows, textures and gradients. Much better, right? Next, give it some air. Remove the unnecessary decimals. Remove the lines in the background and the unnecessary legend. After all, there’s only one metric. Clean up your fonts. Use one font. Use one color, except for making your less important labels lighter. Remove unnecessary bolding and italics. Make sure your labels have enough room. If they remain readable, you can make them as small as you want to give them some breathing room from each other. Finally, simplify your color scheme and match it to your brand, so the whole thing looks like it belongs in your presentation, not someone else’s. You can even throw away all lines and slap the labels on the columns themselves. There! Isn’t that a thousand times better than the original?